Circe was the daughter of Perse, one of the Oceanids, and Helios, the Titan sun god. You may know her as a witch. That is all I knew. Yet she is so much more. Yes, a witch. A sorceress. A nymph. A goddess. A phenomenal woman. 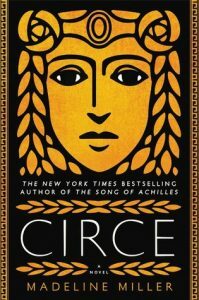 Madeline Miller’s account of Circe’s life is nothing short of extraordinary. After finishing this book, I feel Circe in me. I feel her pain, her happiness, her anger, her fire, her strength, her sorcery. Her peace. I feel it all. You will as well. You will rage with her. You will feel her sorrow and loneliness as it was your own. You will feel her vengeance and revel in it. And Circe’s power? UNMATCHED. I never thought you could truly feel such power through a book. No, that is not correct. I have felt the power OF books and OF stories my entire life. I have felt the power of characters but I have never finished a book feeling the power of a goddess. Her role in all of Greek mythology is untold. She influenced and was involved with all of them. Albeit from afar, in her exile at Aeaea. Helios, Hermes, Athena, Pasaphae, Perses, Aeetes, Daedalus, Odysseus, Jason, Medea, Ariadne, the Minotaur…Circe played a part in each of their tales and so many more. Be ready to wrestle with Circe’s growing discovery of the price of immortality. What it means to love and hate as a goddess. Or more importantly, as a mortal. What we all feel to err. To fall short. To not be able to take back grave mistakes. To atone for our sins. To live in this wretched world and keep moving forward. And this is me being dramatic and cliche, but the blessed agony and ecstasy of it all. But what else is life? This entry was posted in Reviews on February 3, 2019 by heatherlee.